Classic dishes, as I have found out, may have many variations. 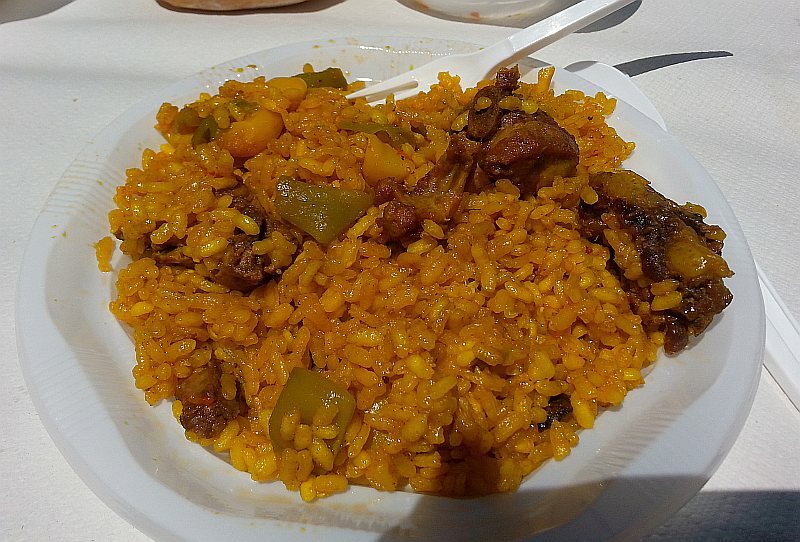 For example, Paella and Ensalada Valenciana (Valencian Salad). Both dishes originate from Valencia, Spain, but all are made in different ways by different restaurants. So it was an adventure each time I ordered one of these dishes. A simple salad, similar to what I could get in Vancouver. The only “Valencian” or Mediterranean specific ingredient to me would be the green olives. This was a very tasty salad. In particular I liked the pickled unripe figs. At first glance they look like small green olives with a stem, but on closer look, you see patterning on the skin, and when you bite in, it is filled with hundreds of tiny seeds; no single large seed. The pickled figs are quite addictive, sour, similar to a green pickle, but has some other vegetal flavour I cannot place. All I can do is recommend to try them when you are in Spain, or pick up a bottle from a Mediterranean grocery store. 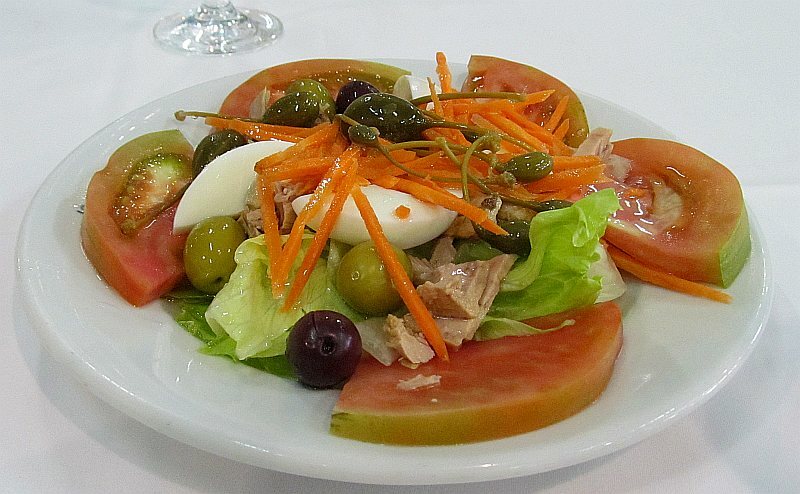 Each bite of the salad has different flavours and textures, from the tuna to the tomatoes, eggs, and more. Recommended. And to round out this article, I tried to see which of the two above dishes served to me was the more authentic version. I searched many recipe websites, trying to concentrate on Spanish websites, as I felt that these websites would be have their recipes uploaded from cooks in Spain. Again, I found many variations, but I think the La Pepica one would be the better variation. Whatever variation you prefer, please try to make an Ensalada Valenciana this summer as a nice start to a summer dinner (and pair it with a Rosado wine), or try it at a restaurant in Spain if you are lucky enough to travel there. Enjoy! Living in one country or city for most of your life you come to expect certain things when you go to a restaurant to eat. Visiting another country, especially one that is significantly different in language and culture, I have found can suprise you about food and meals. Here are 4 of my current observations from my visit in Valencia, Spain. When sitting at a table and enjoying your meal, in North America you would expect salt and pepper. In Spain I have observed that black pepper is not provided at all. Salt is always at the table, and if it is not, the server will bring you salt when they serve you your dish. People really like to salt their food in Spain. I would love to sprinkle some pepper on my dishes, but am adjusting. Many of the marinated fish dishes that I had, were heavily salted. Maybe not using much salt back in Vancouver has sensitized me to sodium. But a warning if you do order some marinated fish at a tapas bar, be prepared that it could be quite salty. Back in North America, one of the tapas dishes I really like is Patatas Bravas; cooked potates, cut in cubes and then coated with a spicy tomato/paprika sauce, and sometimes with a poached egg. 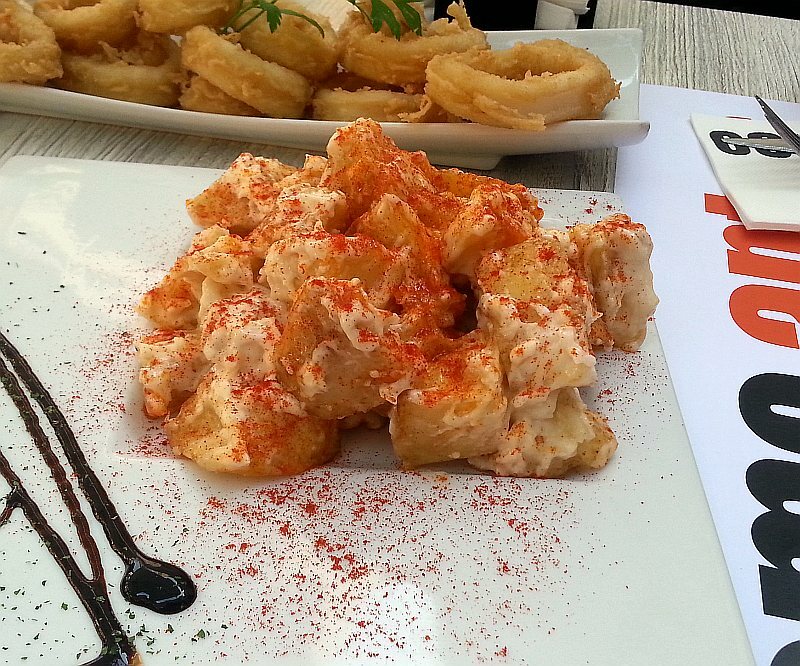 Here in Spain, when I ordered the Patatas Bravas, I get a bit of the tomato/paprika sauce, but it is mostly mayonnaise that coats the potatoes. It is quite filling and rich. Sometimes dishes that are made in North America, do not match the dish in it’s country of origin. Similar to food dishes, drinks can also differ from country to country. When I enjoy Sangria in Canada, I get a pitcher full of chopped fruits, and is not too sweet. In my latest Sangria experience in Spain, my pitcher contained only 2 slices of lemon, wine, and a sweet fruit juice. Not quite what I expected. Again you need to be flexible and go with the flow. Related to my Sangria observation, is the love of sugar here in Spain. Desserts like turrone are quite sweet. Non-alcoholic drinks, in particular, horchata, which is popular here, is quite sweet. Along with the horchata, they love to have a sweet pastry, in particular a Farton, a long thin sweet bread topped with icing or icing sugar. A typical salad dressing in Canada is oil and vinegar based, blended with various spices. 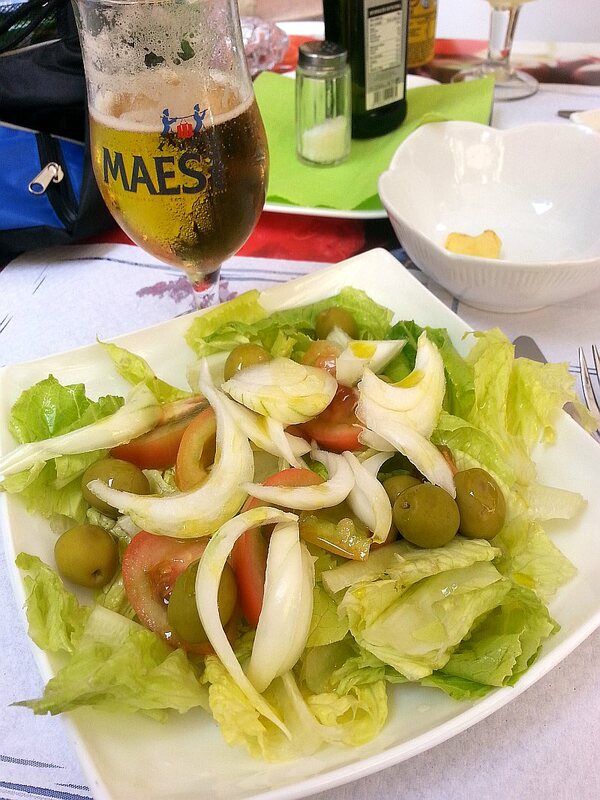 I have found in Spain that when I receive the salad, I am also given a bottle of olive oil and of course salt. I miss the acidity of vinegar for my salad, but embracing the Spanish way of doing things. I’m sure I will come across more observations on food and wine before my time in Spain is over. Stay tuned on my blog and on Twitter. Cheers. 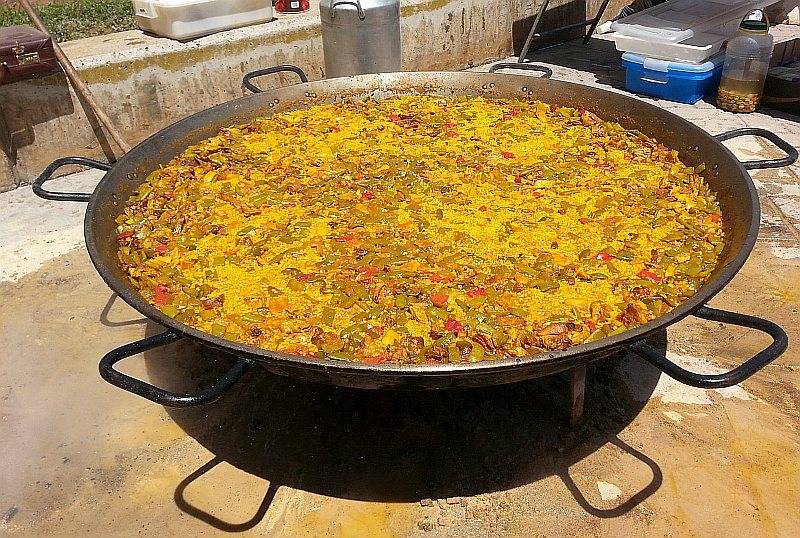 You probably knew that paella was invented in Spain, but did you know that it originates from the city of Valencia? Also did you know that sausage, chorizo, is not an ingredient in traditional paella? 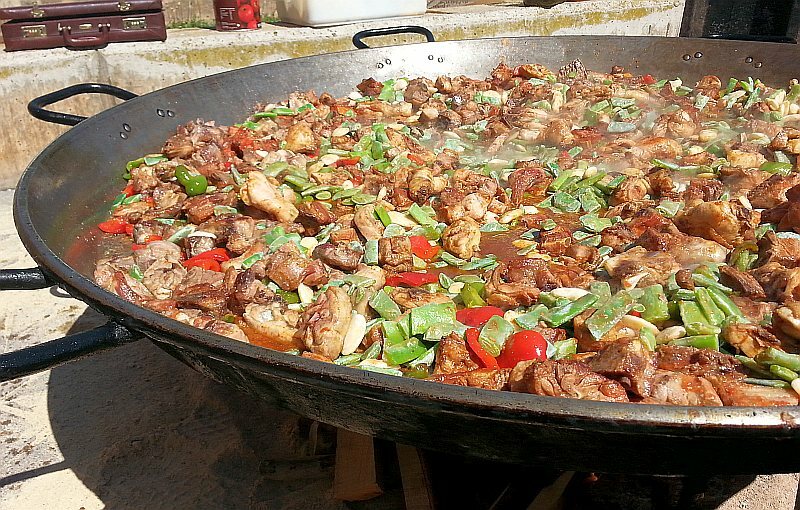 Did you know that there are many different styles of paella; with some using seafood, rabbit, rice or noodles? 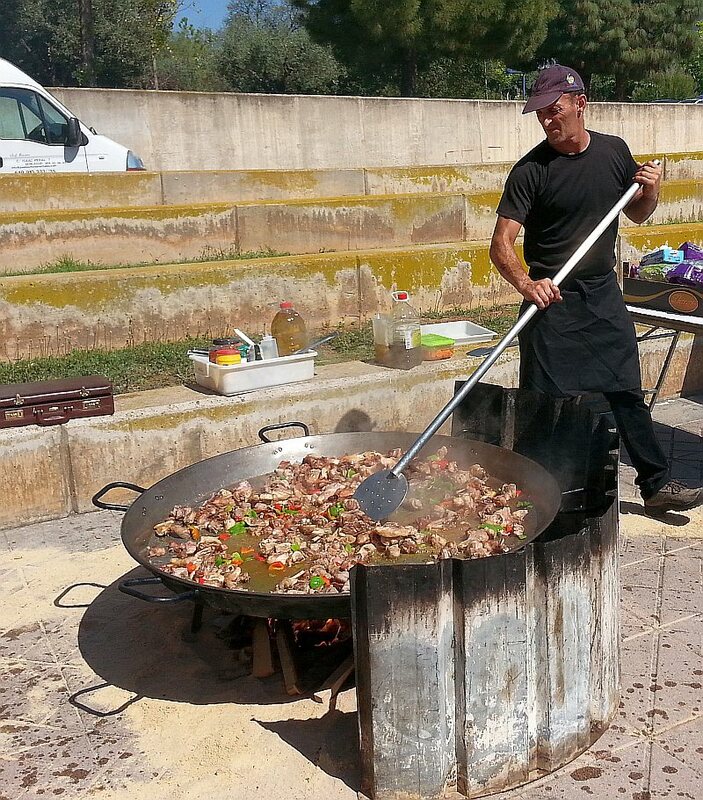 Come along and read about my experience with paella freshly made today for me, and others, at a conference I am attending in Castellon de la Plana, just a short train ride from Valencia. Two paellas were made today; one vegetarian, and the other a mixture of two types of meat. The meat one I was told is traditionally / commonly made with chicken and rabbit. 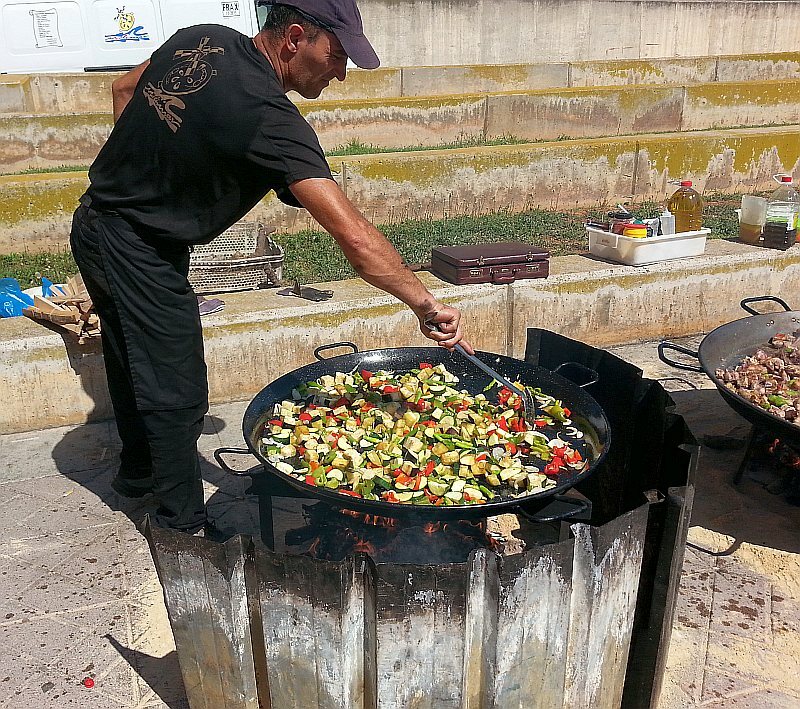 A very large paella pan was heated over a wood fire. Vegetables and the meat were cooked in the pan, and spices added. After a while rice was added followed by broth, then the whole dish simmered until the liquid was absorbed by the rice. I did not get to see all the spices that were added, but saffron is always one of the ingredients to the best of my knowledge. 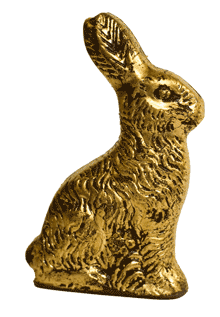 Before this trip I had never eaten rabbit, but now I will have had rabbit in two different dishes. It does taste like chicken, but has a finer texture than chicken. I sat with a lady from Valencia who told me that this paella was quite good. I am not too sure I agree. 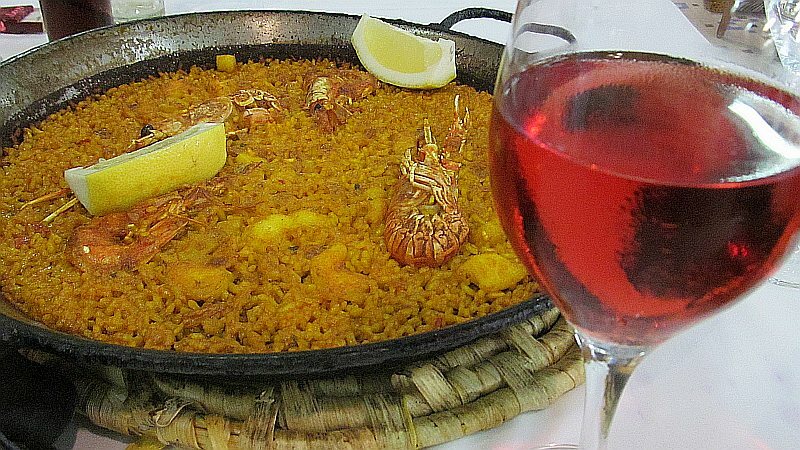 I think it needed a bit more flavour for me, so in Part 2, I will hunt for the ultimate paella when I am in Valencia. In the meantime, check out the pictures of the cooking process for this paella, and think about relaxing in Spain with a glass of Tempranillo from Rioja. Enjoy. Do you love Spanish wine, or want to learn about Spanish wine? There is of course Tempranillo, but there is also other grapes like Mencia you may not have heard of, or what about Spanish sparkling wine? 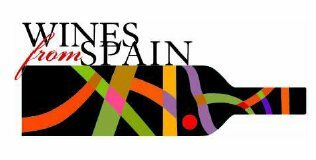 There is a chance for you on April 4 and 5 through BC Liquor Stores to try and learn a bit about Spanish wines. The details are below. The appetizer, the Melange cheese, comes from Trader Joe’s in Washington state. If you have never heard of Trader Joe’s, it is an organic grocery store chain. The one I went to was in Bellingham, WA. This is a hard cheese, white, with no rind. It has a bit of the sharpness that you can get from goat’s milk, but is still very mild. Low amount of salt. 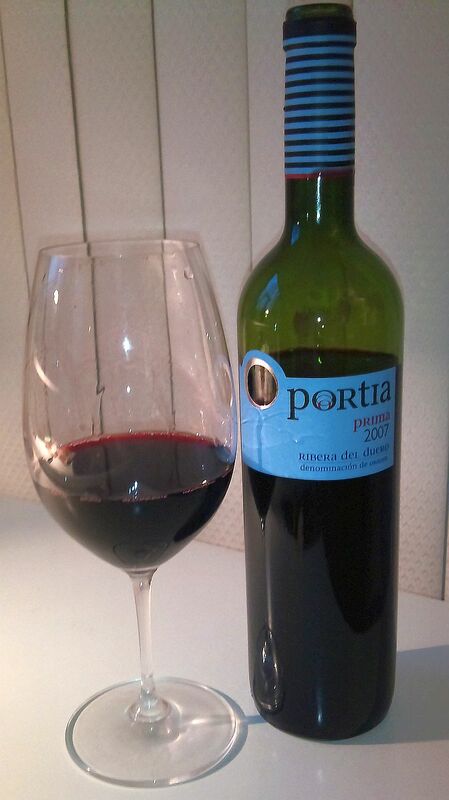 To pair with this cheese and the main course, I opened a bottle of Portia Prima, Ribera del Duero, DOC, 2007, Spain. 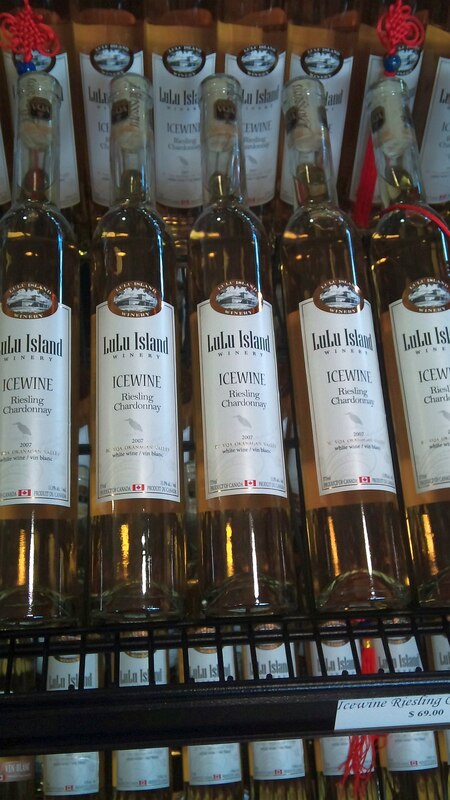 I picked up this bottle at the Vancouver Playhouse Wine Festival last year. It is made from the Tempranillo grape. Opening it and pouring it it in my glass with great anticipation. It was opaque garnet. Dark cherry, plum, leather, vanilla and some leafy aromas. Full body with soft mouthfeel and low tannins. Tobacco, cherries, plum, cassis and some vanilla, oak and leafiness. There was some chocolate in the mid palate. Long length with a peppery finish. A very nice wine that has a good balance between fruit, tannins and acidity. The Melange cheese just melted together with this wine. It was an excellent appetizer pair. The spaghetti sauce was served on top of Trader Joe’s mixed cheese multi-coloured tortellini. The spaghetti sauce was full flavoured, but not spicy. 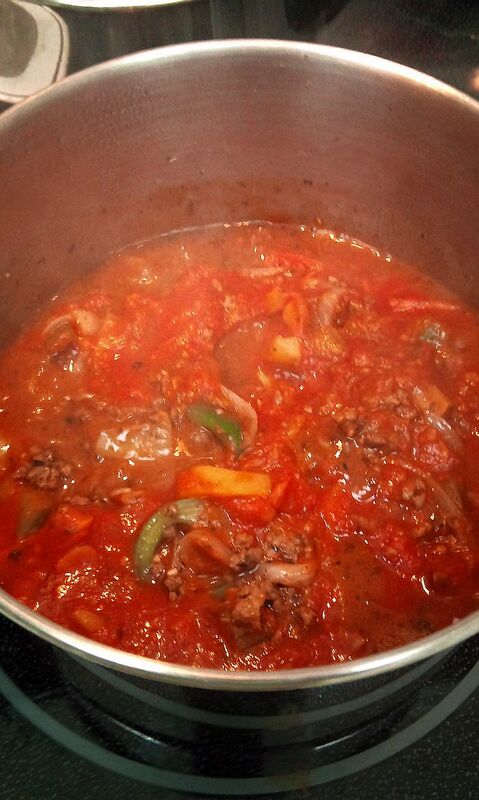 Made with ground beef, tomatoes, green and yellow bell peppers, long thin strips of onion, garlic and chopped celery and seasoned with marjoram and a bit of the Portia Prima wine. Marjoram is related to oregano, but has a bit of a sweetness to it. The richness of the spaghetti sauce tasted nice with the richness of the Portia Prima. After a heavy main course, it is nice to finish it off with some fruit. The clementines are from California. About the size of a golf ball but very sweet and without any seeds. I’m satiated. I hope you have a great dinner today too, whether it is at a Dine Out Vancouver restaurant or at home. Cheers.